American Mythologies #5: dress your way/EVERYBODY IN KHAKIS. Do you see how it is? You can have your own unique style just like everybody else. We’re all individuals! We’re all the same in being utterly original. Here in America we’re a nation of mavericks, we all do what we want to do and like what we want to like. Of course it helps if plenty of other people like it, too. Not everyone of course, but the right people, the cool people, and we can depend on advertising to reliably tell us who those people are. And we can count on the internet to tell us what’s viral and trending, so that we see exactly what everybody else sees, and so that we remember to watch to the very last second, because that is the moment that will astound us! Oxymoronically, even our most conservative politicians are mavericks. They keep us on our toes, we never know what crazy method they’re going to use to ensure America’s complete homogeneity. Remember Herbert Hoover’s rugged individualism during the depression? Well that’s who we are, we’re all individuals who can take care of ourselves, with no help from the government or anyone else at all. We can pull on our own bootstraps! We can iron our own khakis. Because there’s no greater marker of distinctive idiosyncratic style than a good pair of khakis. Originally adopted as a uniform for soldiers, so that they were all uniformly dressed, this drab fabric is supposed to stand out nowhere on nobody; you’ll melt seamlessly into the background wherever you may be. And now it’s the uniform of waiters and clerks and businessmen, of anybody who needs to be just like everybody else. Of course the truth is that although we haven’t always had the highest tolerance for difference, America has a splendid history of eccentrics, some celebrated, some obscure and forgotten. Many of the people who first declared America to be America, and then many of the people who forged West on some mad mission, despite the hardships and deprivations, must have been completely bonkers, and not always in a good way. And the truth is, that despite what my new best friends at the clothing company and their associates in the advertising division might tell us, you can be completely bonkers in a good way even if you’re wearing khakis. Even if you’re wearing the wrong khakis, which are out of style and ill-fitting and which you were forced to buy to work at some job that is strangling your soul. Even then, you can have a world of weird and wonderful thoughts in your head, which are unique and distinctive and entirely yours. We ate these little pies on New Year’s Eve and New Years Day. Because lentils and greens and round foods are supposedly good luck, for health and wealth and happiness. They’re simple, but I thought they were really good. Grate the butter into it, stopping every now and again to mix in what you’ve just added. If you wait to the end it will all clump up again. I stir with a big fork. When it resembles bread crumbs, and all the butter seems to have coated itself with some flour, add about 1/2 cup of ice water. Stir again with the fork. At this point you’ll have to use your fingers, but use the tips, and keep them cool. (and clean!) Pull it together into a ball, kneading a tiny bit to incorporate all of the ingredients. (you might need to add more water). Wrap the ball in foil or plastic wrap, and put it in the fridge until you’re ready to use it. 1 cup lentils, prepared like this. In a large skillet over medium heat, warm the olive oil. Fry the garlic and herbs for about a minute until the garlic starts to brown. Add the pine nuts and spinach, stir and fry until the spinach is wilted but still bright. In a big bowl combine the lentils, spinach mixture and cheese. Stir in the egg (except for the reserved tablespoon.) Add the nutmeg. Season well with salt and pepper. Keep oven at 425. Break off a piece of the chilled dough about the size of a ping pong ball. On a floured surface, roll a piece of dough into a circle about 8 inches across and 1/4 inch thick. Place a heaping spoonful of filling in the center (about as large as the original ball of dough you rolled out. Fold up the edges of the dough, seal lightly, and place seam-side-down on a lightly buttered baking sheet. Repeat with the rest of the dough and the rest of the filling. Prick the top of each pie with a fork and brush with egg. Bake for 20 = 25 minutes, until golden on top and firm to the touch. This entry was posted in crust, lentil, pie and tagged american eccentrics, american mythologies, new years eve food by Claire. Bookmark the permalink. I hate khakis. I love your post! Are khakis chinos? Your post made me think of Monty Python, which is always good. These little pies look great, must try. 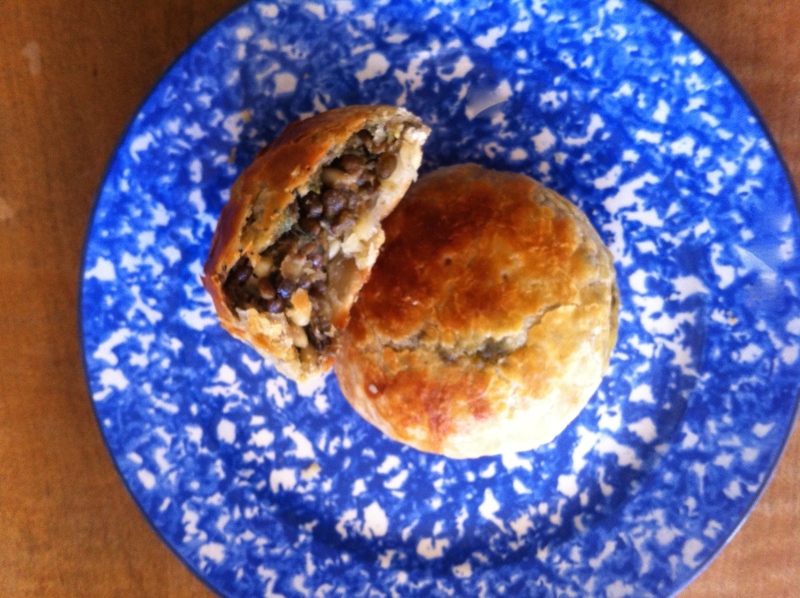 We too ate pie at New Year – a sort of cross between a galette and a Cornish pasty. Happiness guarantee, a good pie. I think Khakis are chinos! I think khaki was originally the color, and chino was the fabric, but now the words or sort of interchangeable. Mmm…galette and cornish pasty! Sounds perfect.